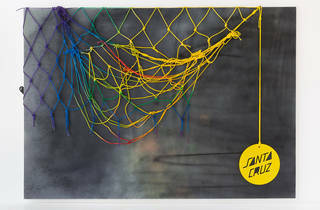 At first blush, White’s atmospheric paintings—draped with multi-colored fishnets and embellished with rail-cloud icons of the type you’d find on your smartphone (along with eight-byte valentine hears and other other, more obscure images)—appear to be a pure product of Los Angeles. 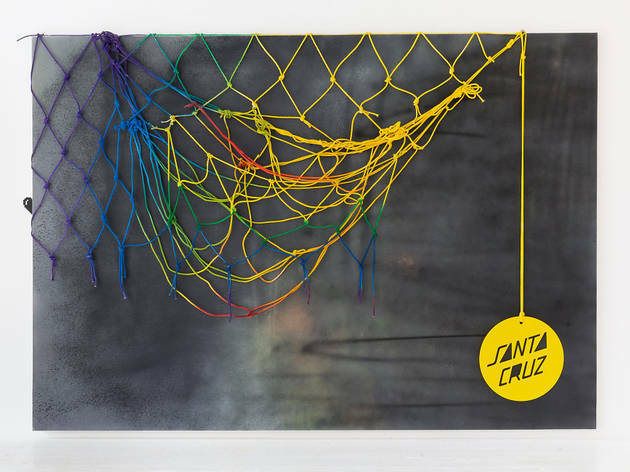 But White is Connecticut native and her show (which includes sculpture) is really about an elusive California dream of skateboard and surf culture as imagined by someone from outside the West Coast. That distance is measured in the exhibit’s title, which isn’t a reference to the actual NoCal paradise, but to a skateboard company located there.